Back in the day, we had some amazing games to play. Contra, Sonic, Prince of Persia, Road Rash, Mario, the list just goes on and on. Thinking about them makes you remember all those hours wasted on those fun games, but it also makes you wish for a current gen remake, doesn’t it? The task of bringing back a dusted yet legendary game is a tough task, simply because of all the expectations that come along with it. A game vastly popular and successful in its time, might not be able to make the same impact in the current trend of games. And if you change the main core, well then that again makes the game lose its foundation. As such, many game developers have simply dropped the idea of making a sequel or remake to their once highly successful games. This is what gives rise to the concept of a spiritual successor. A spiritual successor or sequel is simply a remake in the modern era, sharing the same core with an old game. Based on this concept, comes the sequel to Road Rash. Yes, you read it right. Thanks to Pixel Dash Studios and EQ Games, we finally get to see what Road Rash would have looked in the current generation, in the form of Road Redemption. But is this nostalgia all that the game offers? Or does it have a stronghold of its own? Let’s find out. Note: We reviewed the game on a Windows 10 PC with NVIDIA GTX 1060, and a 2016 MacBook Pro. While the game supported on Windows, macOS, and Linux, a dedicated GPU is necessary to run the game well. Even though Pixel Studios and EQ Games call it Road Redemption, there is no denying the fact that the game is indeed built from Road Rash’s ashes. 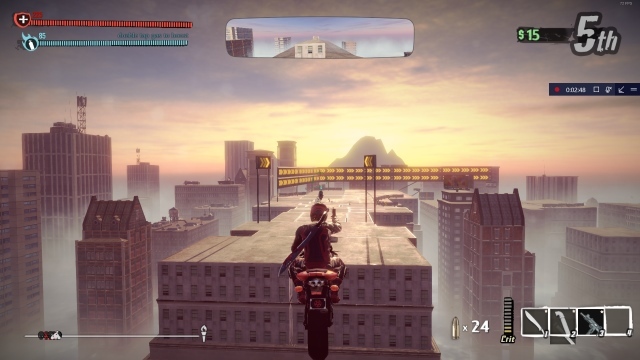 Road Redemption hopes to maintain the same fundamental aspect, but with a graphics overhaul. This generation provides graphic designers with some powerful modules to work with, but rather than making it a very graphic-intensive game, the dev team has chosen to stick with the arcade-style visuals. Sure, the graphics look way better as compared to the original Road Rash, but then again, the base of the game is still the same. 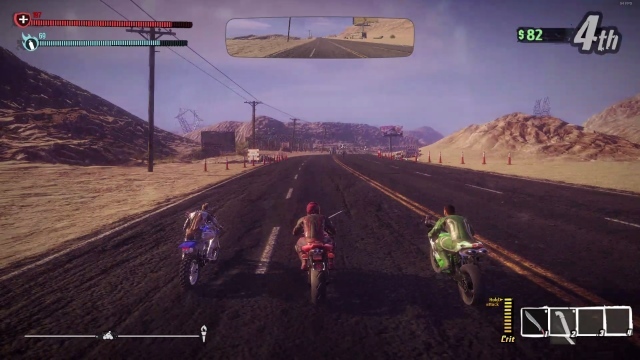 Set in the barren wastelands of the American Westlands, Road Redemption carries forward the arcade graphics style, only to uplift the graphics quality to pure 3D. The motorbikes, as well as the player models, have been very well designed, in order to ensure crisp graphics. The surroundings and the wastelands exhibit a glimpse of the classic Road Rash but definitely feel current gen. The crispy and quirky weapon graphics add to the fun, and the entire outline of the graphics part has been made in order to maintain the arcade feel of the game. If you’re redesigning a yester-year game’s success story, your main focus is not on the graphics but the entire gameplay. This is where I’d consider Road Redemption to be a mixed bag. It offers a great gameplay, well, mostly. Let’s discuss the good things first, shall we? The game offers a plethora of weaponry to choose from, ranging from guns, axes, swords, bats and what not. Oh, and destroying (read annihilating) your enemies with these feels just so satisfying. While playing Road Rash, you had to choose between assault or racing. 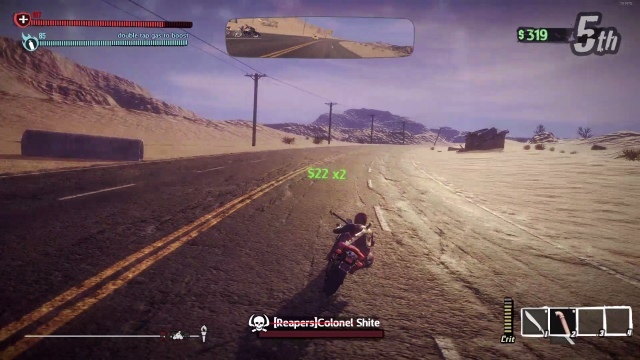 With Road Redemption, you get to do both at the same time. Maybe it’s just me, but I could actually go on killing off my enemies all day long. Along with the keyboard, the user can use the mouse to control the camera and square off against your opponents. 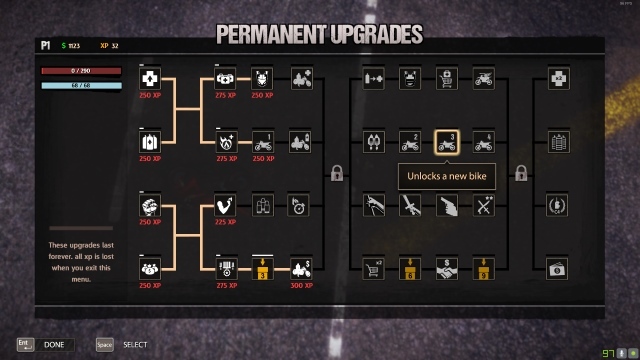 And like most games out there, Road Redemption has full controller support. So, you can easily enjoy the game while playing with the ease of your Xbox 360 Controller or the Logitech Gamepad F310. But is it really all that great? The game does suffer from a few flaws. Firstly, despite the years of development behind the game, it does lack optimization. Yes, it’s not as bad as PUBG, but it does require some tweaks to run better on a wider segment of systems. Also, having played both the Early Review version as well as the final release version, I can assure you that even though the controls have been made easier, the game still suffers from poor vehicle steering. While the game has gone with the arcade style graphics, half the models on the track have been weirdly shaped, that the player just abnormally crashes into. Although there is a reset button to return back to the track, it would have been great had such an issue not existed in the first place. Despite its flaws, the overall gameplay is still good. It’s not great by any means, but it’s not that bad either. The bad part is the lack of gameplay hours, something that I’ll be addressing later on. The game comes with 4 modes, Campaign, Campaign+, Classic Quick Play, and Online. While the majority of the gameplay part remains the same, there are obviously a few differences between the gameplay modes. Let us talk about each of them in detail, shall we? 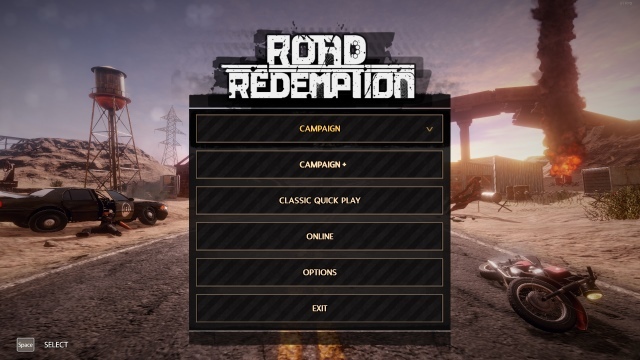 As the name suggests, Campaign mode is the Story mode of Road Redemption. The story revolves around the concept of an assassin who has murdered the leader of a group, and the group is now offering a bounty for the assassin’s death. You are a member of the Jackal biker group, one of the many biker groups out there competing for the reward. Your major competitors are the Reapers, Sigma, and the Phantom biker groups. 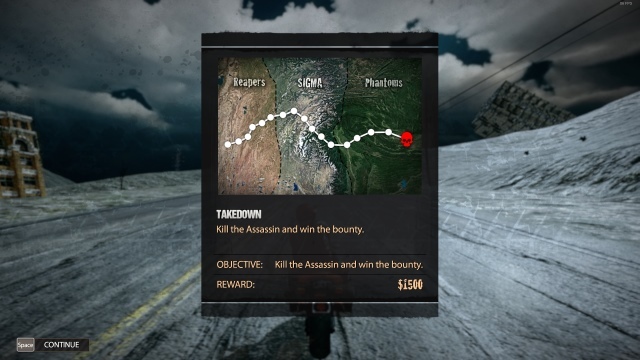 The campaign mode is divided into multiple stages, and the tracks with their objectives are randomly generated at each level. The campaign follows the concept of a “single life”, where you have to kill opponents to increase your health. Once you die, your campaign is over there, and you have to start from the beginning. With each death, you earn XP, and you can use that XP that unlock better skills. The good thing is that despite the multiple deaths, the unlocked skills stay with you. Now, while some might like the feature of a single life, I, for one, wasn’t really fond of it. 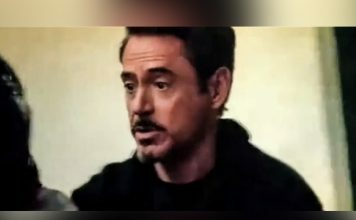 Imagine having to go through multiple stages of fights, only to die at the last second, and have to restart it all over again. Sure, I might have a bigger health capacity now, I might be able to inflict more damage on my enemies. But at the cost of losing my entire progress in the campaign? Umm, definitely no. While the game is definitely fun, the fact that you lose your entire progress is definitely cringy. Now, who doesn’t love a challenge? Coming to the Campaign+ mode, if you were expecting something big, I’m sorry to let you down. The Plus mode is nothing but the entire Campaign mode with an enhanced difficulty mode. You can play the Campaign+ mode once you’ve successfully completed the normal Campaign. As if giving up your progress in the normal mode wasn’t enough, the Plus mode makes it even harder to continue through the multiple stages. 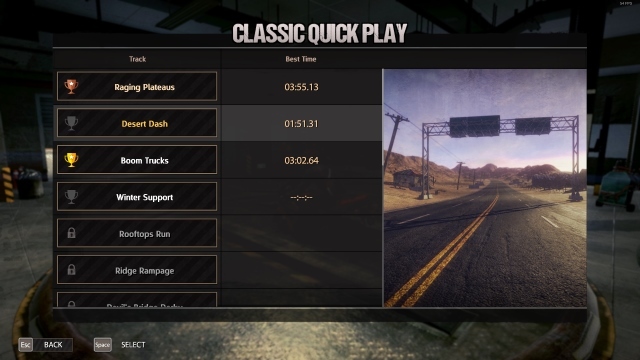 The Classic Quick Play is the simple racing mode, where you select a bike and a driver, and then choose from a list of 16 tracks. 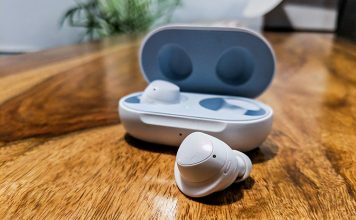 Initially, the user gets to choose from just 3 tracks, and you work your way to unlocking more tracks while racing for medals. The tracks are based on deserts, mountains, and city traffic. There’s also the quirky rooftop tracks, which I found to be the best of them all. The classic quick play mode also has support for a local 4-player split-screen mode. While racing against AI is great, having the ability to rain havoc on your buddies is even better. Sadly, you do lose a bit of functionality in the process. The gameplay stutters in the split-screen mode, and unless you’re playing on a large TV, the compressed screen just doesn’t do justice to the ruthless motorbike warfare. Maybe they should have learned from the Call of Duty series, who, in recent years, dropped the idea of 4-player split-screen and switched to 2-player split-screens. Even though that means fewer buddies to play at a time, at least the experience factor remains untampered in such a mode. 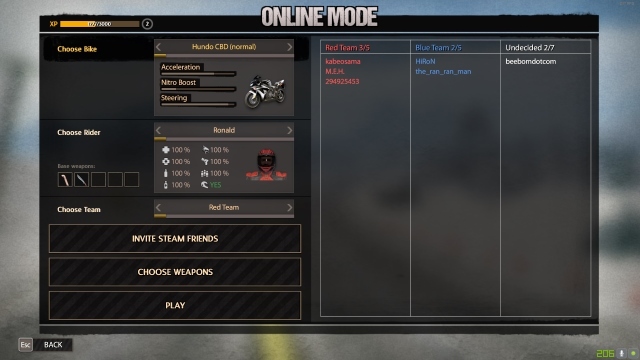 The included online mode works similar to the quick race mode, except for a few changes. To start with, aside from choosing your character, you also get to select the weapons you’d like to begin with. Furthermore, you can also select what sort of weapons would you be picking up while racing on the track. That being said, there is a twist to it. 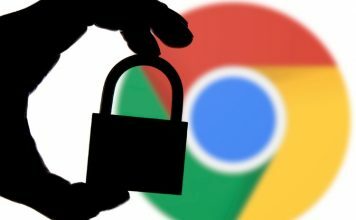 Your online profile is completely different to your local profile. So, in order to unlock more characters and weapons, you need to work your way up the level ladder. This might seem like a good option to some, but I’d much prefer the Rocket League way, where my local experience translates directly to my level, both online and offline. Also, the another difference, as opposed to the classic mode, is the fact that the players are divided into two teams – Red and Blue. Each time has a set of racers, and the victory is based upon the team’s average position in the race. So basically, even if you finished first, if your team members were lagging behind the opponent team, essentially, your team loses. Yes, it does give a sense of teamwork, but to be honest, I couldn’t care less for my “fellow-mates” on the internet. Overall, the online gameplay works well. Despite being backed by an indie developer, the servers work well. On top of that, Steam’s matchmaking has always been great, so that’s another plus point. That being said, do watch out for some minor lags here and there. 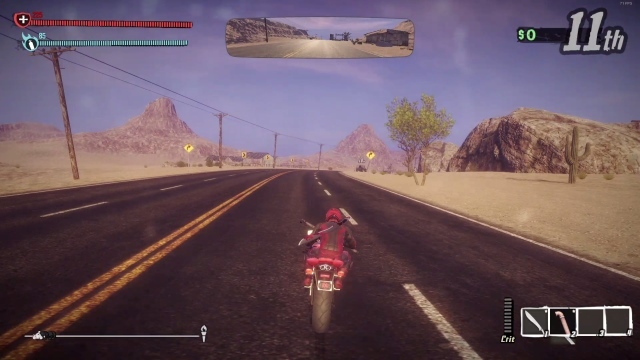 Road Redemption has been in the works since late 2014 and was only available as an Early Access game on Steam. 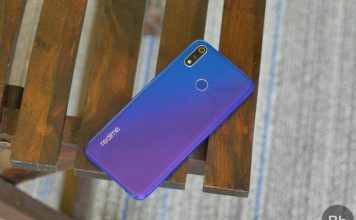 The final version was released worldwide on 4th October 2017. The game runs via Steam and supports Windows, macOS, and Linux. That being said, it does require a dedicated GPU to work properly. 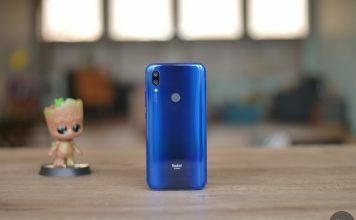 At a price tag of $19.99, the game is affordable and offers a decent experience for its price. That being said, I’d have genuinely loved to see a console port of the game. Considering that the open world Road Rage, which is also based on the same foundation as Road Rash, is set to be released late November, it would have been a good idea for Pixel Dash Studios to capture the console market beforehand. 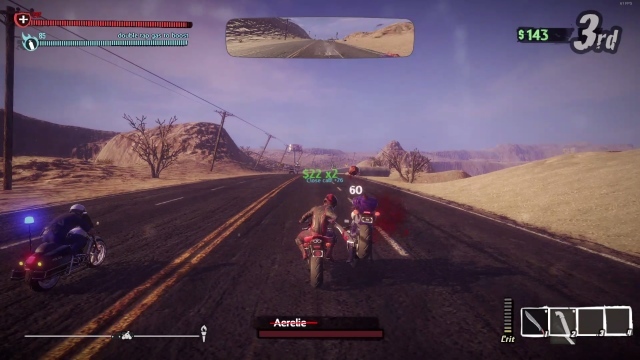 Road Redemption: So Should You Buy It? So what do I actually make of it? Well, the campaign mode, except for a couple of boss fights, is the same three or four objectives on a set of different tracks. The multiplayer mode, on the other hand, is great and should do well to keep you entertained. So, is the game worth your money or not? Well, in my opinion, yes, it is. While the single-player mode does leave you longing for something more, the experience in itself is great. Once you’re in the race, even if it’s for the same repetitive objective, it feels just so great. And then there’s that nostalgic value as well. For any old time gamer or a new gamer who’s into racing games, Road Redemption is an easy recommend. Sure you might not waste a lot of hours into it, but whatever amount you do, you’ll have fun for sure. 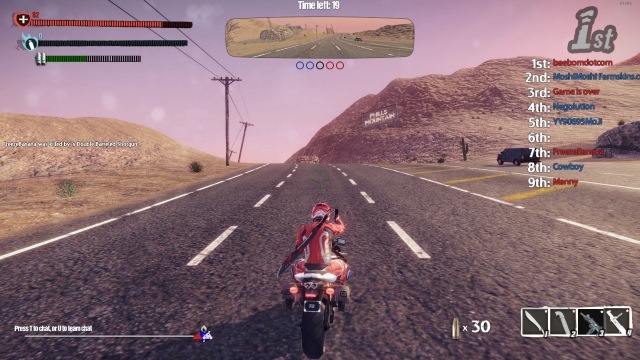 Road Redemption is a short-lived but nonetheless, a great racing warfare game that pleases the heart in many ways. The reimagination of Road Rash in this generation of computing does come off well, and apart from the nostalgic value, does have a standpoint of its own. It might not be a must-play but is definitely a good enough time-killer, especially considering its price point.